A major re-ordering project to make Melton’s St Mary’s Church fit for the 21st Century has reached a key milestone. Plans for changes to the Grade I listed church are moving forward after the Leicestershire Diocesan Committee recently agreed to approve the latest application from the St Mary’s project group. It’s good news but it’s the chancellor for the Leicestershire Diocese who will now make the final decision to grant the faculty application, reject it or recommend changes be made. Lifting and renewal of the flooring throughout the building; improved access throughout; introduction of under-floor heating; new lighting scheme; full electrical re-wire with enhanced facilities; remodelling the Sir Malcolm Sargent memorial organ (existing casework to be extended to include new pipework); organ console to be movable (connection points in new locations); installation of a servery; west porch - adjustment of the floor, cleaning of internal stonework, creation of an inner draught lobby; renewal of the sound system. 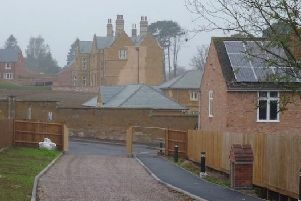 Toilet provision in St Mary’s; north door - creation of a draught lobby; changes to pathways outside the west porch and north door to improve access; improved lighting outside the west porch and north door. Project committee chairman John Craig said: “The approval of the plans by the Leicestershire Diocesan Committee has been warmly welcomed by the congregation. “The chancellor alone will have the opportunity to grant the faculty, reject it or recommend changes be made. We look forward to a positive response.